What does second quality, or 2Q, mean? FRSafetyCloseouts.com continuously brings you ONLY the best flame resistant garments on the market, from ONLY the best manufacturers. We carefully select which manufacturers we carry based on their commitment to quality and garment performance. Our manufacturers construct and test each garment to rigorous standards, guaranteeing perfection in each item. A large percentage of these garments pass these difficult standards, and are considered "first quality." The garments that do not rate as highly, or have minor blemishes, are considered "second quality," or 2Q. Are 2Q products still safe? 2Q products offer absolutely identical protection as first quality products. 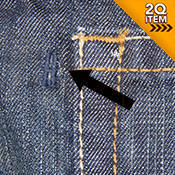 Many times, it is almost impossible to detect the blemish on a garment that has caused it to be considered 2Q. It has simply found itself in that category because of the high standards to which our apparel is held. Not only are 2Q products just as safe as first quality products, their sizing and fit are also accurate. What types of blemishes can be expected from 2Q items? The following is a list of the cosmetic blemishes that 2Q garments may have. It is important to note again, that these minor blemishes do not affect the protective qualities of these garments. 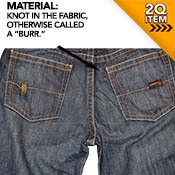 Material - These 2Q products will have a fabric defect, such as: a crease, missing yarn, a streak, a dye stain, etc. 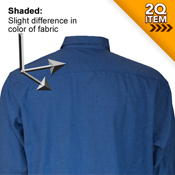 Shade - These 2Q products will have inconsistent shading, meaning: the coloring on one panel may not match the others, the pocket is slightly different in color, etc. These are usually subtle, not drastic, inconsistencies. Soil - These 2Q products will have light soiling. 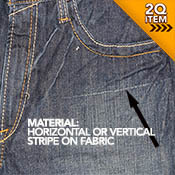 Workmanship - These 2Q garments are marked as such because of the construction of the product, including: incorrect thread color, a crooked pocket, an off-shade button, etc. What is the return policy of 2Q items? We are confident in the quality and value of, and completely stand behind, our 2Q products. If you are not completely satisfied with the garment you receive, we will happily accept that item as a return or exchange. Please feel free to read FRSafetyCloseouts.com return policy. Are 2Q items eligible for resale?